Autistic savant is a term that describes a person with autism who has a special skill or exceptional talent. A person with savant abilities commonly demonstrates extraordinary skills involving memory recall, art, music and mathematics. The occurrence of savant abilities is higher in the autistic population than in the non-autistic population, which suggests a connection between autism and savant abilities. The condition of autistic savant was first medically recognized in the 19th century. At that time, a person with the condition was called an idiot savant. The word savant means learned person and is derived from the French word for knowing. During the 19th century, a person with mental or intellectual disabilities was called an idiot. In 1978, Dr. Bernard Rimland introduced the term, autistic savant, in a Psychology Today article to describe autistic people with exceptional skills. The term has replaced the outdated terminology. Splinter memory skills--Memory recall of a favorite subject is the most common type of savant ability. For example, a savant may memorize every detail of all of the US highway system maps. Talent skills--A person with savant abilities can have special ability in areas such as art, math or music. Prodigy level skills--Only 25 autistic savants in the world demonstrate prodigy level savant skills. A prodigy level savant can play a series of complex musical pieces on the piano after only hearing it once. Only 10 percent of people with autism are considered autistic savant. Less than one percent of individuals without autism demonstrate savant abilities. Mathematics--Example: A person who can calculate complicated math problem in his head in mere seconds demonstrates mathematical savant ability. Art--Example: An artistic savant might create masterpiece quality paintings without formal training. 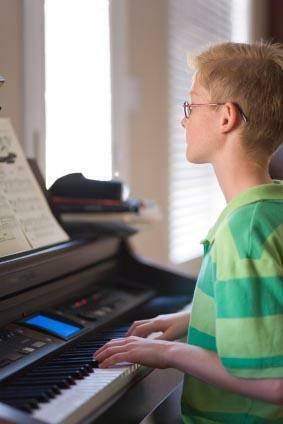 Music--Example: A music savant may play the piano well without any musical training. Language--A rare savant ability includes an extraordinary ability to learn foreign languages without training. Autistic savant Daniel Tammet learned to speak Icelandic in seven days. The reason why some people with autism exhibit savant abilities is unknown. Autism expert, Dr. Bernard Rimland suggests that people with autism may possess a more highly developed ability to concentrate and focus their attention on a special skill. Other theories indicate that it has something to do with the right hemisphere of the brain. CT and MRI scans of the brains of autistic savant individuals suggest that the brain's right hemisphere may be compensating for left hemisphere brain damage. Dr. Bruce Miller, a San Francisco neurologist, provided evidence to support the theory about the connection between savant ability and the right hemisphere of the brain. Miller discovered savant abilities in patients with dementia that affected the left temporal area of the brain. CT and MRI scans of the patients' brains indicated the same right hemisphere brain activity results as younger autistic savants. At Flinders University in Adelaide, Australia, researchers conducted a study to create previously non-existent savant abilities in a group of volunteers. The volunteers did not have autism or any other intellectual disability. The researchers temporarily suppressed the frontal temporal lobe function and then applied transcranial magnetic stimulation. During the study, 5 out of the 17 volunteers temporarily demonstrated new savant level skills. The Flinders University researchers suggested that everyone is capable of savant abilities, which are lying dormant in most people's brains. The existence of the autistic savant condition is another complexity of the autism spectrum disorder. The inspiring connection between autism and savant abilities demonstrates that some people with autism can achieve a great deal. The condition's potential connection with right hemisphere brain function also provides hope that ongoing research may reveal treatment options that can help improve the lives of all people with autism.